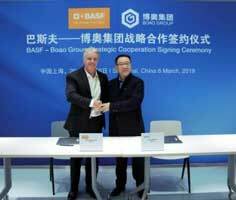 German chemical firm BASF has signed a strategic cooperation agreement with automotive parts manufacturer Chongqing BOAO Industrial Co., Ltd. to collaborate on the development of polyurethane (PU) system products in China. Under the terms of the cooperation, BASF will provide materials and technical knowledge, while Boao will focus on applications and product development. Together, the two parties will also advocate the use of polyurethane systems in construction, and foster opportunities for market promotion. “Fuelled by the strong growth of the construction industry, there is an increasing demand in China for composite products that provide superior insulation for energy efficiency, and excellent impact resistance for demanding structural applications,” said Andy Postlethwaite, Senior Vice President, Performance Materials Asia Pacific, BASF. “We are delighted to be cooperating with our long-term partner, BASF, to explore new PU composite applications for the construction industry,” said Wang Wuyang, Chairman, Boao Group. Both parties will also continue to explore the development of new PU systems for structural parts in the automotive industry. As a leading producer of automotive parts, Boao has been collaborating with BASF since 2003 on the development of PU materials in automotive seating solutions.